How hilarious is that? He looks like he's auditioning for a role from the Nativity Story, or on his way to jail at a commune. Mr. Dork assures me I should not be making one for him anytime soon. 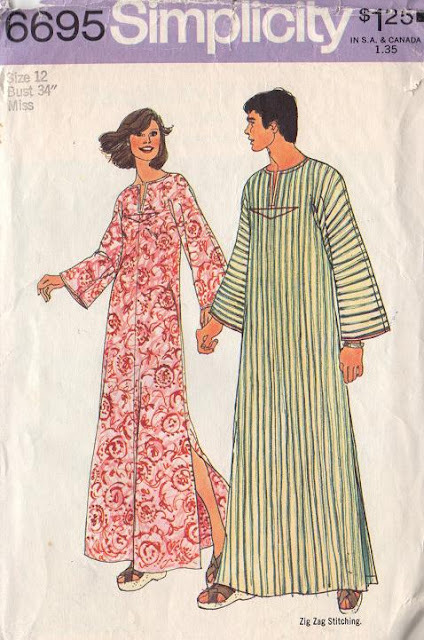 The giveaway is for this vintage (1974) Simplicity pattern, ladies size 34" bust. I actually like the cut of the garment for a tunic. Can't get over the dude though. GIVEAWAY OPEN TO ANYONE, ANYWHERE. Just leave a comment below - why not give me your opinion on the menswear? We'll keep this one short: I will announce the winner on Friday August 6th along with the winner of the giveaway in the previous post. IF YOU HAVEN'T ENTERED YET, scroll down and enter my Reader's Choice Giveaway. I'll make the winner a custom garment. But not a dude dress. Pinky promise. At first I thought maybe it could be a nightshirt... Hey, men used to wear them too!.. but he's wearing sandals. I guess he's off to join some commune? are those wedge sandals he's wearing? too funny. Where in the world did you find this!!? I've actually wanted to make one for myself for summer, and maybe one for my niece for winter out of flannel, so I hope I win! Thanks for a good laugh, if I don't! I thought it was a nightshirt too! (Hubby wants one for summer) but with sandals... must be a 70's pattern hey, heh! Do you think the artist drawing the guy on the pattern was cracking jokes the whole time, too? "Hey, I'm going to draw his sandals with a bit of heel." "Knock it off, Lisa, we've got a deadline." "My Tony would never wear this kind of thing. Can you picture Steve in one?" "I made him one for his birthday. What are you saying?" Ha ha ha! Dude in a dress, that's awesome. Don't think I could get my dude to wear one. I like the tunic idea. I just assumed it was a nightshirt, but I guess not? It did make me think of the news guy on the radio station I listen to...he wears a sleep shirt of some sort. This is too funny! I would totally make and wear the dude dress (is it even in the pattern?). Enter me please. Oh. My. Goodness... LOVE it! My husband (34) is in a 60s cover band with a bunch of guys who came of age during that era. I've made him a couple pairs of bellbottoms to wear at gigs and such, but have yet to tackle a tunic style shirt. I'd love to make that man-dress for him - cut it off about hip length! That is so cool! It would make a great tunic or a Christmas costume. Too funny. How about the matching sandals they both are wearing, it has a slight heel??!? A long time ago I had a boyfriend who wore a night shirt, just like something from The Night Before Christmas. This pattern would make a great tunic, that is what i would sew. If I had this pattern, i would make this for my husband as a halloween costume, whether he liked it or not! He always says he would never wear these things that I make for him, then discovers that they are comfortable and insists on wearing them when company comes over. You don't have to choose me because I've already won a pattern from you but this is absolutely hilarious. His sandals are great. This pattern would look great as a tunic though! Love it. I remember back in the day, the cool men (on TV) would wear these. I'm sure this pattern would be useful if he had a part in 'Twas the Night Before Christmas or Scrooge! I have actually saw a man on a beach here wearing one, he was much older, maybe he has had it for awhile. My man wouldn't be caught dead in it either, but Omar Sharif and Peter O'Toole rocked it, back in the day! Looks like a basic thobe/kameez to me. Love it. Too bad I missed this one. My husband would wear it.